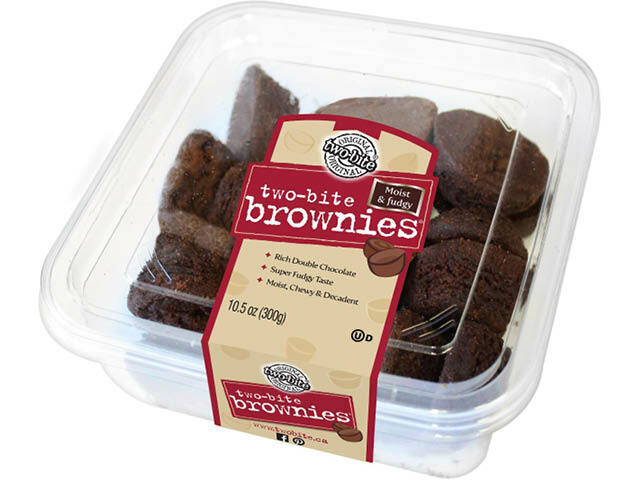 The original two bites that started it all, two-bite brownies® are beloved for good reason: they’re the acknowledged gold standard in indulgence. Resistance is futile! Moist. 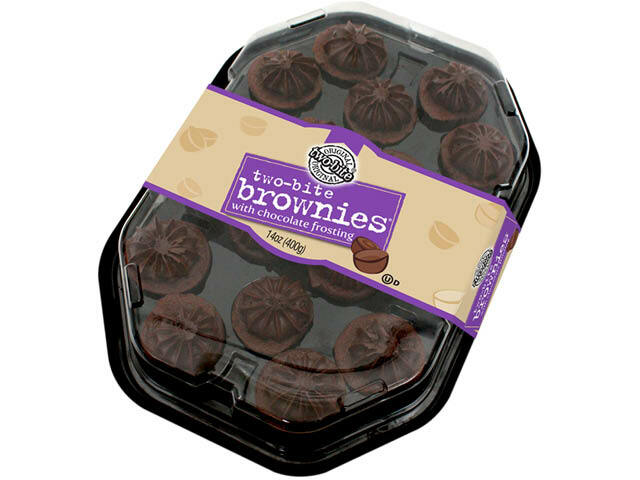 Fudgy. Loaded with rich flavor. Whether you’re sharing with the family or winning over even the choosiest guests, these delights are the anytime treat that make everyone smile. 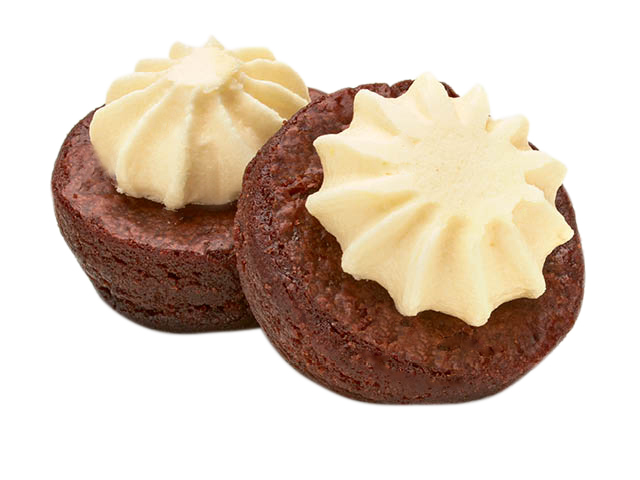 Traditional plain for purists, and varieties that turn heads: think sweet icing and sprinkles, crunchy pecans and gooey caramel, or decadent, real cream cheese. 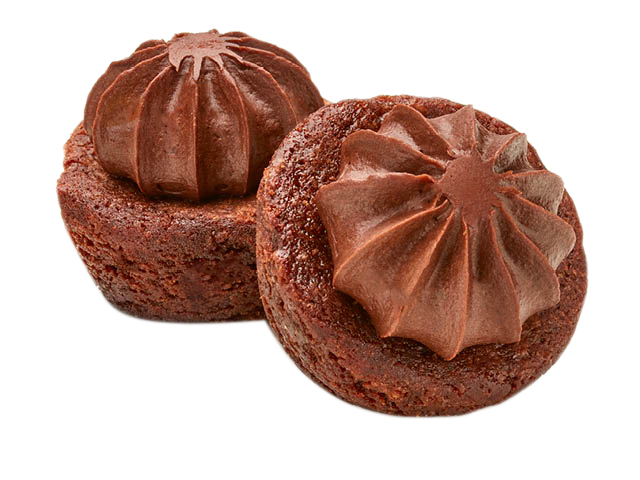 Our moist and fudgy brownies, covered with a decadent chocolaty frosting. INGREDIENTS: SUGAR, ENRICHED WHEAT FLOUR (WHEAT FLOUR, NIACIN, REDUCED IRON, THIAMINE MONONITRATE, RIBOFLAVIN, FOLIC ACID), SOYBEAN OIL, ICING SUGAR, SHORTENING (CANOLA, PALM, MODIFIED PALM AND PALM KERNEL OIL), WATER, COCOA POWDER (PROCESSED WITH ALKALI), CORN SYRUP, EGG WHITE, CHOCOLATE (SUGAR, CHOCOLATE LIQUOR, COCOA BUTTER, SOYBEAN LECITHIN, VANILLA EXTRACT), GLUCOSE, MONO AND DIGLYCERIDES, SALT, BUTTER (CREAM, SALT), NATURAL AND ARTIFICIAL FLAVOR, WHEY POWDER, MODIFIED CORN STARCH, LEAVENING (SODIUM ACID PYROPHOSPHATE, SODIUM BICARBONATE, CORN STARCH, MONOCALCIUM PHOSPHATE, CALCIUM SULFATE), SOYBEAN LECITHIN, POLYSORBATE 60. CONTAINS WHEAT, EGG, SOYBEAN AND MILK. 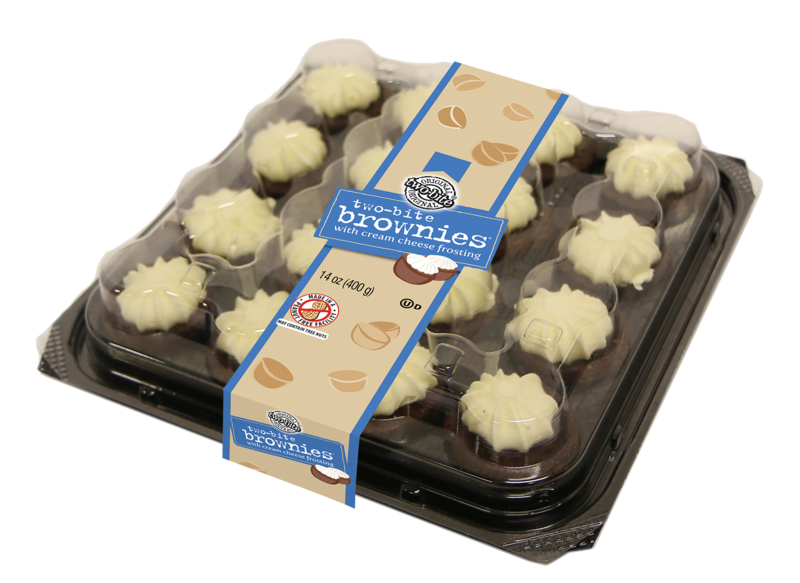 Our rich and chocolaty brownies topped with a fluffy cream cheese frosting. 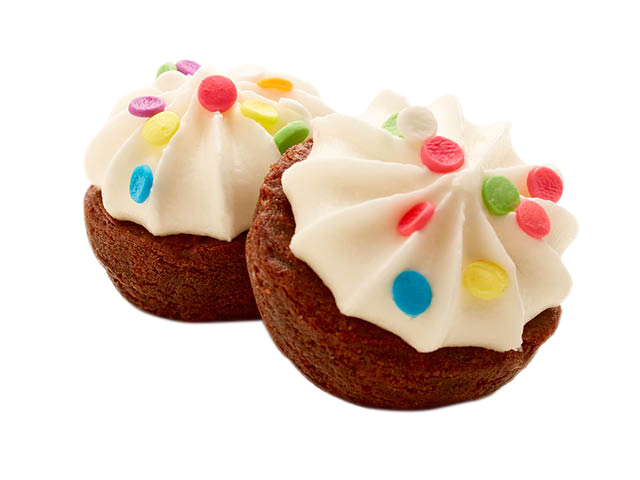 INGREDIENTS: SUGAR, BLEACHED ENRICHED WHEAT FLOUR (WHEAT FLOUR, NIACIN, REDUCED IRON, THIAMINE MONONITRATE, RIBOFLAVIN, FOLIC ACID), ICING SUGAR (SUGAR, CORNSTARCH), SOYBEAN OIL, VEGETABLE OIL SHORTENING (PALM OIL, CANOLA OIL, FRACTIONATED PALM OIL, FRACTIONATED PALM KERNEL OIL, MONOGLYCERIDES, POLYSORBATE 60), CREAM CHEESE (CREAM, NONFAT MILK, SALT, LOCUST BEAN GUM, BACTERIAL CULTURE), EGG WHITES, WATER, CORN SYRUP, CHOCOLATE (SUGAR, CHOCOLATE LIQUOR, COCOA BUTTER, SOYBEAN LECITHIN [EMULSIFIER], VANILLA EXTRACT), COCOA POWDER (PROCESSED WITH ALKALI), NATURAL AND ARTIFICIAL FLAVOR, SALT, MODIFIED CORNSTARCH, WHEY (MILK), LEAVENING BLEND (SODIUM ACID PYROPHOSPHATE, SODIUM BICARBONATE, CORNSTARCH, MONOCALCIUM PHOSPHATE, CALCIUM SULFATE), SOYBEAN LECITHIN, MOLASSES, POTASSIUM SORBATE (PRESERVATIVE), COLOR (BETA CAROTENE). CONTAINS WHEAT, EGGS, SOYBEAN, MILK. 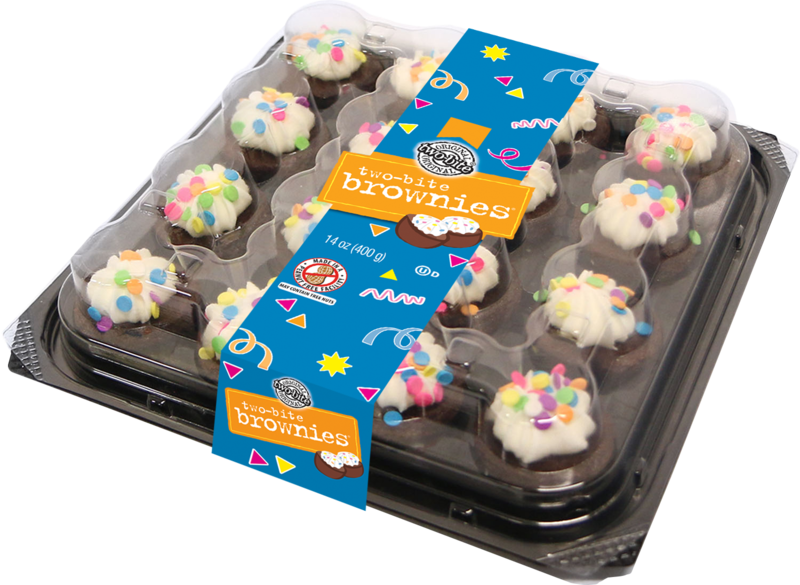 Make everyday a celebration with our moist and fudgy brownies, covered in a fluffy vanilla frosting and fun confetti sprinkles. 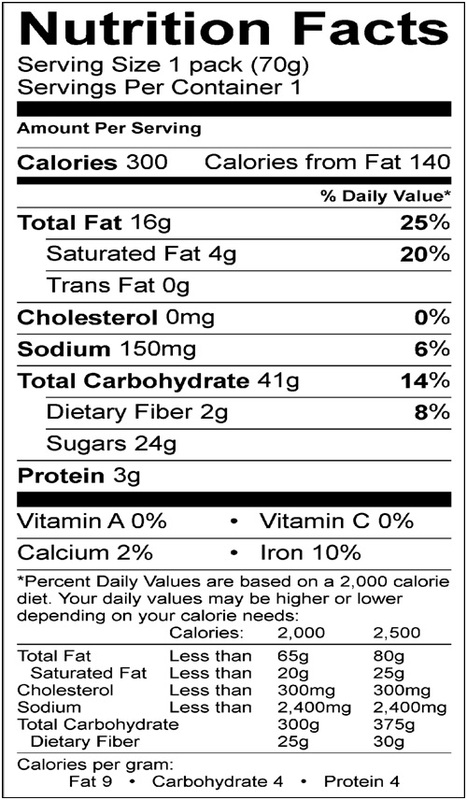 INGREDIENTS: SUGAR, BLEACHED ENRICHED WHEAT FLOUR (WHEAT FLOUR, NIACIN, REDUCED IRON, THIAMINE MONONITRATE, RIBOFLAVIN, FOLIC ACID), SOYBEAN OIL, ICING SUGAR (SUGAR, CORNSTARCH), VEGETABLE OIL SHORTENING (PALM OIL, CANOLA OIL, FRACTIONATED PALM OIL, FRACTIONATED PALM KERNEL OIL, MONOGLYCERIDES, POLYSORBATE 60), EGG WHITES, CORN SYRUP, WATER, CHOCOLATE (SUGAR, CHOCOLATE LIQUOR, COCOA BUTTER, SOYBEAN LECITHIN [EMULSIFIER], VANILLA EXTRACT), COCOA POWDER (PROCESSED WITH ALKALI), SPRINKLES (ICING SUGAR [SUGAR, CORNSTARCH], PALM KERNEL OIL, MODIFIED CORNSTARCH, CORNSTARCH, SUNFLOWER LECITHIN, COLOR [FD&C YELLOW #6, FD&C YELLOW #5, FD&C BLUE #1, FD&C RED #3], SHELLAC, POLYSORBATE 60), INVERT SUGAR, MARGARINE (SOYBEAN OIL, FRACTIONATED PALM OIL, WATER, SALT, WHEY [MILK], SOYBEAN LECITHIN, MONOGLYCERIDES, NATURAL FLAVOR, ANNATTO EXTRACT [COLOR]), VITAMIN A PALMITATE, VITAMIN D3), NATURAL AND ARTIFICIAL FLAVOR, MODIFIED CORNSTARCH, SALT, WHEY (MILK), NONFAT DRY MILK, MONO- AND DIGLYCERIDES, LEAVENING BLEND (SODIUM ACID PYROPHOSPHATE, SODIUM BICARBONATE, CORNSTARCH, MONOCALCIUM PHOSPHATE, CALCIUM SULFATE), SOYBEAN LECITHIN, MOLASSES. 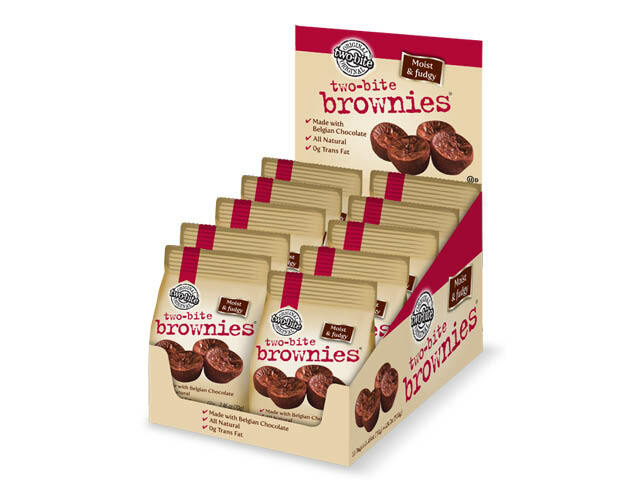 Our moist and chewy brownies in a convenient individual pack size. The perfect sweet treat when you’re on the go. 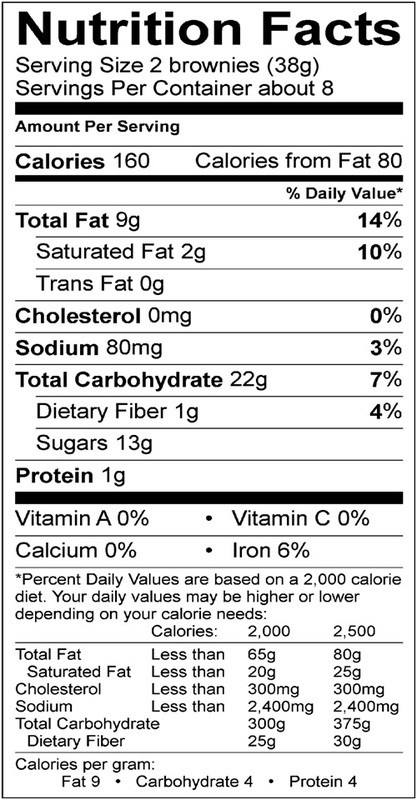 INGREDIENTS: SUGAR, BLEACHED ENRICHED WHEAT FLOUR (WHEAT FLOUR, NIACIN, REDUCED IRON, THIAMINE MONONITRATE, RIBOFLAVIN, FOLIC ACID), SOYBEAN OIL, EGG WHITE, CORN SYRUP, WATER, CHOCOLATE (SUGAR, CHOCOLATE LIQUOR, COCOA BUTTER, SOYBEAN LECITHIN, VANILLA EXTRACT), SHORTENING (PALM, CANOLA AND MODIFIED PALM OIL), COCOA POWDER (PROCESSED WITH ALKALI), SALT, NATURAL & ARTIFICIAL FLAVOR, WHEY POWDER, MODIFIED CORN STARCH, LEAVENING (SODIUM ACID PYROPHOSPHATE, SODIUM BICARBONATE, CORN STARCH, MONOCALCIUM PHOSPHATE, CALCIUM SULFATE), SOYBEAN LECITHIN. 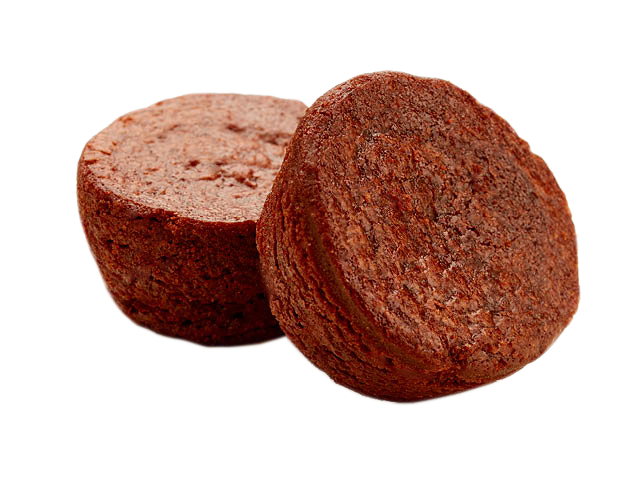 Our classic brownie has a moist texture and rich chocolatey goodness in every bite. INGREDIENTS: SUGAR, ENRICHED WHEAT FLOUR (WHEAT FLOUR, NIACIN, REDUCED IRON, THIAMINE MONONITRATE, RIBOFLAVIN, FOLIC ACID), SOYBEAN OIL, EGG WHITE, CORN SYRUP, WATER, CHOCOLATE (SUGAR, CHOCOLATE LIQUOR, COCOA BUTTER, SOYBEAN LECITHIN, VANILLA EXTRACT), SHORTENING (PALM, CANOLA AND MODIFIED PALM OIL), COCOA POWDER (PROCESSED WITH ALKALI), SALT, NATURAL & ARTIFICIAL FLAVOR, WHEY POWDER, MODIFIED CORN STARCH, LEAVENING (SODIUM ACID PYROPHOSPHATE, SODIUM BICARBONATE, CORNSTARCH, MONOCALCIUM PHOSPHATE, CALCIUM SULFATE), SOYBEAN LECITHIN.